I’m a huge sports fan. (American) Football is my biggest weakness.Â In fact, in late August, it is not unusual to hear my Girlfriend say “See you in February” on Sunday afternoon just because she knows that I have been with Football much longer than her.Â Therefore, it takes precedence over our relationship and she knows better than to expect to get any attention from me on Sunday afternoons during the season. I end up learning about or discovering things through sports quite often.Â Occasionally, I hear something during a broadcast that perks my ears.Â There are also hours of sports radio I subject myself to each week.Â Earlier this week, Colin Cowherd was having his annual auction for The V Foundation, a charity devoted to Cancer Research.Â During the show, Colin mentioned Charity Navigator.Â I was intrigued. Charity Navigator, America’s premier independent charity evaluator, works to advance a more efficient and responsive philanthropic marketplace by evaluating the financial health of over 5,400 of America’s largest charities. 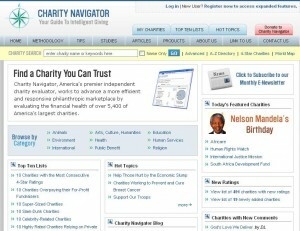 What is so great about Charity Navigator?Â Well, besides the ability to browse through thousands of worthwhile charities by name, you can also browse by location, size, cause or check out their “4-star charities“.Â You can also read their blog, which has charity related articles on a slew of subjects. One of the aims of Charity Navigator is to give piece of mind to donors.Â Only reputable, trusted and effective charities are aggregated on the site, leaving those who are looking to give a sense of confidence about how their donations are being used. 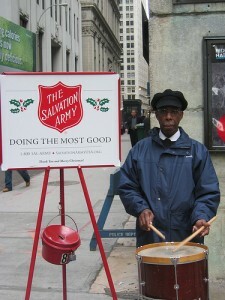 Charity Navigator gives each organization ratings based on a number of criteria that is divided into 2 main categories.Â The first is Organizational Efficiency.Â Efficiency is broken down into four “performance categories”.Â These categories are Program Expenses, Administrative Expenses, Fundraising Expenses and Fundraising Efficiency.Â The second main category is Organizational Capacity.Â Capacity is broken down into three “performance categories”.Â These categories are Primary Revenue Growth, Program Expenses Growth and Working Capital Ratio. After evaluating variables from this criteria, Charity Navigator assigns a rating (from 1-10) to each charity. I very much enjoy the fact that this website does a lot of work that can keep people like you and me from throwing money away on a scam charity.Â I highly recommend this site for anyone looking for a worthwhile cause who is unsure about exactly where to donate.Â Try it out for yourself and let me know what you think, and what I may have missed.